England must learn to "manage the game" better after falling to a 3-2 friendly defeat against 10-man France, says manager Gareth Southgate. The Three Lions had taken the lead through Harry Kane's strike in Paris, but still lost despite Raphael Varane's dismissal early in the second half. England have also lost to Germany and drawn against Spain this season. "You have got to control possession and stay calm but I thought we looked more anxious with 10 men," said Southgate. Tottenham striker Kane netted the opener in the ninth minute, but the French hit back through first-half goals from Samuel Umtiti and Djibril Sidibe. On 47 minutes, Real Madrid defender Varane hauled down Dele Alli in the box and was given a straight red card, as Kane stepped up to equalise. But they were unable to hold on as the the impressive Kylian Mbappe laid the ball on for the equally-brilliant Ousmane Dembele to drill home the winner 12 minutes from time. "We just didn't manage that period of the game as well as we needed to, I thought we tired," said Southgate. "We put in a huge amount of effort and it was a problem for us with their pace and athleticism. "I think we should have got a result. In the space of 90 minutes we saw the things we are very good at, with the ball we caused a lot of problems and looked a threat and created good openings and took our first goal very well. "On the other hand we have to get better as a team and at managing the game, especially when they went down to 10 men." Are players taking on Southgate's information? 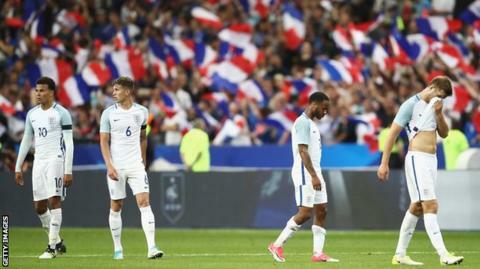 England failed to get a result against France, just as they did in their 1-0 defeat by Germany in March. Against Spain last November, they were leading 2-0 until the 89th minute, before Iago Aspas and Isco scored late goals to level. This was Southgate's eighth game as boss, since taking over from Sam Allardyce, and they have won three, drawn three and lost two during his reign. The former international defender added: "To be honest it has been absolutely what I thought. We have been competitive in these three friendlies for long periods but we have had to play at our absolute limit to stay in all three matches. "The pleasing thing is the players are taking on board tactical information and the three games have provided different tests. "We have not got anywhere near these teams when it comes to tournaments and finals so that is why we need to play them. "We need to see the reality of where we are and you have to play against the best otherwise it masks where you are as a team." Read more on Russia World Cup 2018: What shape are England in with one year to go? Read more on Video referees: What happened in England's first experience with new technology?